Some stories are very hard to put into words. They are hard to write about and even harder to speak about. But they still need to be told. Ophélie Fournier was 16 months old when she passed away peacefully while lying in bed next to her mother. Before falling asleep, her parents, Stéphanie and David, spent hours holding her, kissing her and saying goodbye. They knew she was going to die soon. Her body could no longer support her. 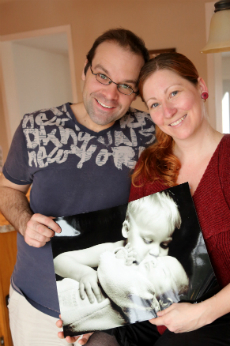 Stéphanie was six months pregnant when she lost her daughter. At the time her eldest son, Jacob, was only three. She explained to him that Ophélie was now a star in the sky and he rushed to the window to try to find her. The days that followed felt empty. All she wanted to do was hold her daughter again, feel her warm cheek against hers. Nobody knew what to say. Some friends stopped talking to her and David, while others went on as if nothing happened - as if their lives weren’t completely changed forever. “Losing a child is like losing a part of yourself. Eventually you will learn how to live, but it’ll never be the same,” says Stéphanie. After receiving such devastating news, the Fournier family decided to go back home, surround themselves with family and friends and make the most of Ophélie’s short life. They had no control over this horrible situation, but they did have the choice to wake up every day and make the most of it. “We really wanted to give her a life of absolute happiness,” says Stéphanie. Working with the MCH’s Palliative Care department, Stéphanie and David looked at all the options and services available to them and their daughter. Day by day, they began to adapt to her needs. Ophélie slept a lot. She had a severe developmental delay and suffered from stiffness in her legs and arms. But her parents chose not to focus on the things she couldn’t do and instead focused on making her life as peaceful and happy as possible. She didn’t react to sound, but she did react to touch, so her parents held her as much as they could. They would caress her cheeks and snuggle with her in their bed. She also loved being in water, so her parents would draw her baths where she would sit calmly for hours. Another thought eating away at Stéphanie and David was Ophélie’s official diagnosis. There was none. Geneticists had found a genetic mutation on one of her mitochondrial DNA, but they had never seen anything like it. They couldn’t tell if the mutation was responsible for her disease or whether Jacob and their newborn son Adam were at risk. They also didn’t know if the mutation started in Ophélie or was passed on by Stéphanie and David. Then on October 16, 2014, almost four years to the day after finding out that their daughter was going to die, they got the news they were waiting for. Ophélie died from a neurodegenerative disease called Pyruvate Dehydrogenase Complex Deficiency. A mutation had occurred inside her mitochondrial DNA code, which meant the mitochondria, also known as “the powerhouse of the cell,” couldn’t supply enough energy to her cells. “When Ophélie’s brain asked for an extra dose of energy from the cells that helped create it…well the pool was empty and the cells were not able to charge their batteries,” writes Stéphanie in her last blog post. “This explains why her brain was so small.” The diagnosis also answered a few other concerns the family had. The genetic counselor confirmed that the disease started in Ophélie’s body after conception and was not passed on by Stéphanie and David. There was also no risk to Jacob and Adam. The family now felt like they could turn the page. The MCH Pediatric Palliative Care Program provides comprehensive care for children with life-limiting and terminal illnesses at home and in the hospital. The team addresses clinical issues including pain and symptom management, communication on end-of-life care issues, sibling support, advance care planning, location of care preferences and options, psychological and spiritual assessment, quality of life treatment options, and bereavement support. “Our goal is to maximize the good times and minimize the bad,” says Marie-Claude Proulx, clinical nurse specialist with the MCH Pediatric Palliative Care Program. “We talk with the family about their main goal when it comes to caring for their child and then we help them find treatments that align with that goal. We give them different options to think about and help guide them through the process.” The team works closely with community partners and offers their services 24/7.